Our Magnum range is the complete returnable packaging system, which offers many advantages and gives significant cost savings over one trip alternatives. The containers also increases safety in transportation and provides for improved hygienic handling. The Magnum containers are made of expanded PEHD or solid PP and are 100% recyclable. When folded for storage or return transport they save up to 60% of valuable space. 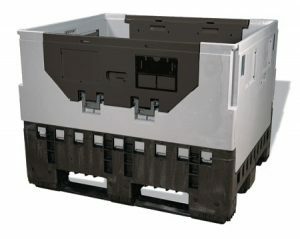 The container can be supplied with access doors and with different pallet versions.